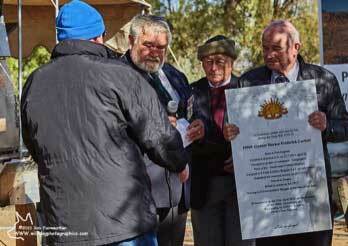 The Centenary of the World War 1 Gallipoli landing was enacted at Farina, where fallen and returned soldiers from Farina were honoured. The ceremony, beginning in almost total darkness was marred only by the gale force winds that continued for most of the morning. After the ANZAC dawn service on the memorial site, a prepared breakfast of egg and bacon roll, rum laced coffee and ANZAC biscuits was served to each of nearly 200 attendees before a ceremony at 9am, during which eight placards were presented to the attendees by visiting Vietnam veterans and descendants of the fallen Farina servicemen. The following story was provided to the Adelaide “Sunday Mail”, published April 26th 2015. 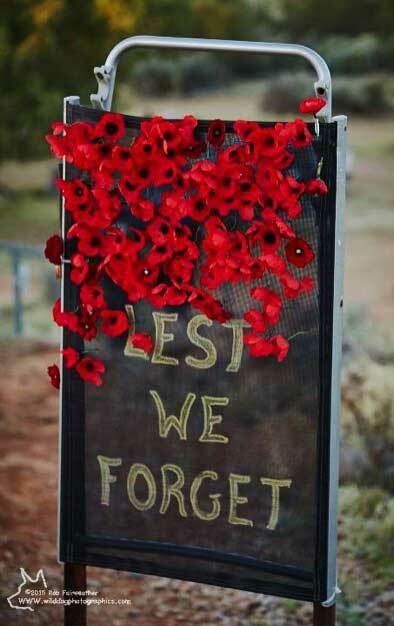 There were more names on the honour roll of Farina residents who died for their country than there are people left on the outback town. When war broke out a century ago, the busy rail and trade centre of 250 residents waved 33 of it’s young men off to far-flung battlefields. Five of them never came home. The fortunes of the town, more than 600Km north of Adelaide, and about halfway between Leigh Creek and Maree, dwindled over the decades, until Farina Station owners Anne and Kevin Dawes were the only ones left. But since 2009, a dedicated group of heritage conservatives has put Farina back on the map, painstakingly preserving what remains of it’s 19th century buildings. 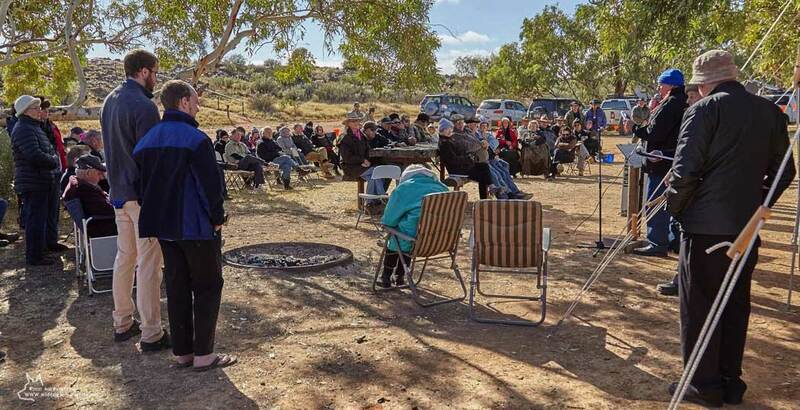 And yesterday the ghost town was revived by the ANZAC spirit, as more than 150 history buffs and travellers from around the world held one of the most remote of commemorations. 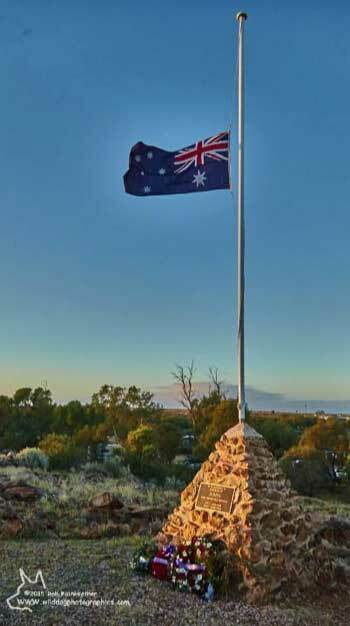 Mrs Dawes said that there were tourists from Scotland, New Zealand and other nations, and many from interstate, adding locals from Maree and Leigh Creek and up to 20 members of the Farina Restoration Group. “It was very moving. It was cold and windy, but that just added to the atmosphere.” she said. 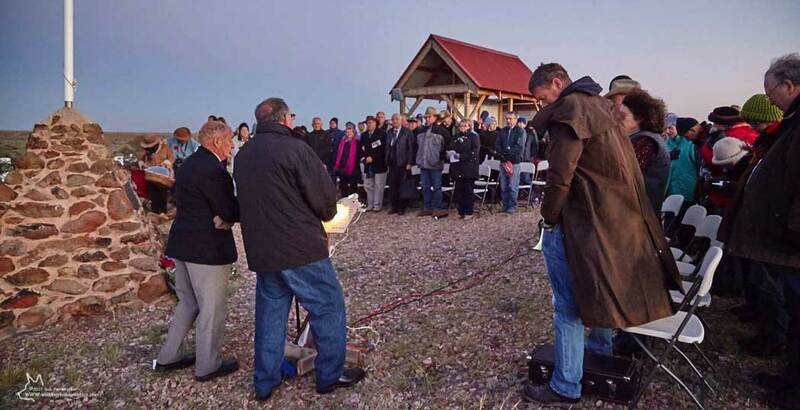 A dawn service was followed by a “gunfire breakfast” – black coffee with rum – and a ceremony of recognition for the eight local servicemen who perished in the two world wars. Descendants of the Farina servicemen and some visiting Vietnam veterans presented a name plaque for each of the eight, to become part of a new memorial wall. “We are giving those residents the recognition they deserve,” Farina Restoration Group founder Tom Harding, 82, said. 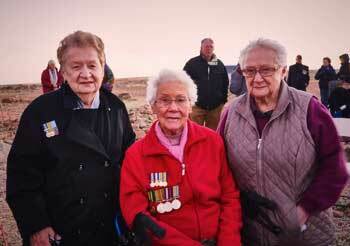 Descendants of world war 1 survivor Corporal William Clement Parsons, who was awarded a military Medal in 1918 for gallantry with the 1st Australian Machine Gun Squadron in the Middle East, were among the attendees. “He was defiant, he was aggressive, and he turned that into a successful trait as an outstanding soldier,” Mr Harding said. Volunteers had put 27,000 man hours into the Farina restoration since 2009. About 140 people worked on the program last year. Olive Bischoff, Ursula Ross, Marj Lamey, daughters of William Clements Parsons. 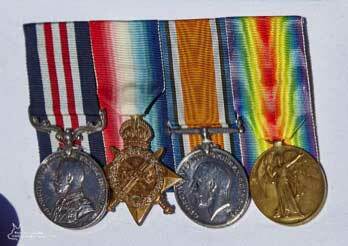 Medals awarded to William Clements Parsons, worn on the day by Olive Bischoff. One of the plaques soon to be mounted for display on the memorial site. This one refers to 19969 Gunner Horace Frederick Corbett.